Homeowners planning a remodeled bathroom featuring a new shower/ tub are often faced with a key choice: Should you install a prefabricated shower stall, or build a custom ceramic tile shower? Pre-fabricated shower stall units are usually fiberglass or acrylic kits created in a factory and shipped to your home in one or several pieces. They can be installed by a professional crew, or by a DIYer. Most shower kits include a shower pan and two or three solid wall panels, although some are one-piece shells, in which the shower base or bathtub is integrated with the walls. One deciding factor in the choice between a one-piece or multi-piece unit is whether you can get a one-piece unit through the doors of your home. Homeowners often choose multi-piece units for this very reason. The multi-piece kits usually come with everything you need: shower pan or tub, molded wall panels with shelves and soap dishes molded into them, and even the shower door. Big box home improvement centers may stock some simpler shower stall kits in the store, but better-quality products will require special ordering based on the precise measurements of your shower alcove space. Once rather cheap looking, the wall panels on shower kits are now considerably more stylish, and often fairly expensive. For a faux-tile look, the panels can be molded with simulated grout lines. Higher-end wall panels made with solid surface materials can closely mimic the look of marble or granite. In contrast to prefabricated shower kits, there are custom-built ceramic tile showers. These are built on site, constructed from scratch by carpenters and tilers. Carpenters construct the structural frame for the alcove, walling it in with cement board panels such as Wonderboard or Durock. Tilers then step in and finish the tile work. The shower door must be custom-ordered to size and installed by the carpenter. 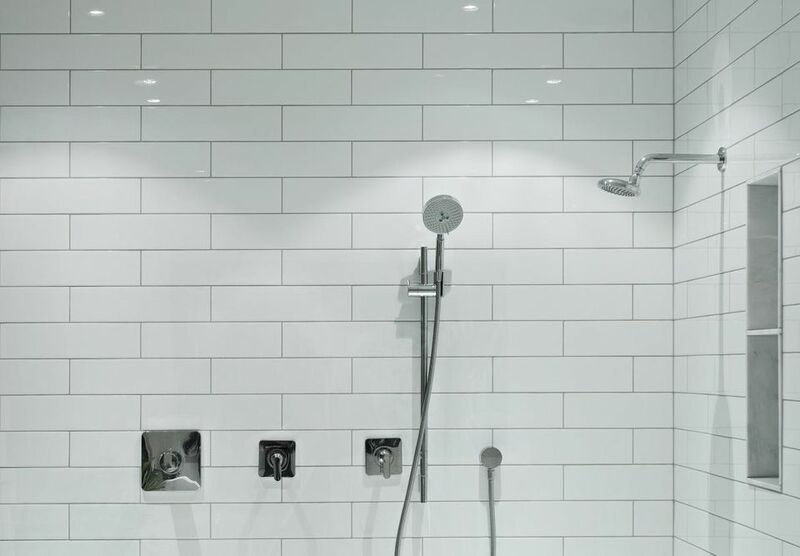 Custom-tile showers are usually considerably more expensive than prefabricated shower units, although luxury-end prefabricated showers come close in cost. A custom-tile, though, exudes luxury in a way that few prefabricated shower units can approach. DIYers sometimes use a hybrid option: installing a prefabricated shower pan, then finishing the walls with custom tiling. Tile shower pans are difficult to construct, and installation becomes much easier if you start with a factory shower pan and then tile the walls. Once considered the ugly duckling of the bathroom remodel trade, pre-fabricated stalls now come in a variety of textures, colors, and shapes, giving tiled shower units a run for their money. Many units can be installed by a do-it-yourself remodeler with moderate to advanced skills. Speedy installation: A new shower can be completed start to finish in a single day, even by a DIYers. Custom-tile showers often take a week or more, even in the hands of a skilled pro. Low cost: Typically, prefabricated showers are much cheaper than tiled stalled shower stalls, often by many hundreds of dollars. Lightweight: Prefabricated showers are essentially plastic of one form or another, and they are considerably lighter than custom tile showers. In a home where there are structural floor issues, a prefabricated shower is a much better choice. Flexible base: Acrylic or fiberglass shower pans have some flexibility and will not crack if there is a small amount of flex to the subfloor. Normally, the prefabricated base is embedded in a thin layer of mortar for stability, but unlike custom tile shower pans, leaking almost never happens with prefabricated shower pans. DIY-friendly: Prefabricated showers are quite easy for do-it-yourself home remodelers to install. Minimal seams: Most prefabricated kits have seams only in the corners and along the top of the shower pan or tub. One-piece units have no seams at all. Fewer seams mean easier cleaning and less likelihood of leaking. Easy maintenance: Prefabricated showers are easier to keep clean than ceramic tile showers, with their multitude of grout lines. Limited styles: Pre-fab kits offer fewer design options than tiled shower stalls. Size limitations: Economy kits are available only in stock sizes. But upper-end kits (which are also expensive) may be custom-ordered to precise dimensions. Awkward size: One-piece units sometimes don't work for remodeling because the size prevents them from passing through doorways. One-piece units are intended mainly for new houses or additions, where they are put in place before doorways are completed. Not environmentally friendly: The plastics used in prefabricated showers are not easily recyclable, and they will not decompose if the materials someday reach a landfill. Lower real estate value Although this liability is less pronounced than it once was, prefabricated "plastic" showers are seen as low-end building materials and may slightly lessen the real estate value of your home when compared to custom tile work. Repairs are difficult: While cracked ceramic tiles are fairly easy to replace, once a crack appears in a prefabricated shower, it is difficult to make repairs. Fiberglass repair kits can be used to make spot repairs, but they will be noticeable. The only other option will be full relining. The principal advantage of a tiled shower is that it allows for more creativity since there are thousands of different colors, patterns, and sizes available in ceramic and porcelain tiles. Design options: Since these showers are built from scratch, there is literally an infinite range of design options possible. Eco-friendly: Ceramic tile is inherently "green" since it is made with natural clay, not plastic. An even greener alternative is eco-friendly tile made with 40 to 60 percent recycled content. Recycled tile looks just as attractive as "from scratch" tile, and it costs roughly the same. Size flexibility: A tile shower can be built to fit any available space. Increased real estate value: Ceramic tile is a premium building material that will slightly increase the resale value of your home when compared to synthetic shower materials. Especially when paired with ceramic tile bathroom floors and stone countertops, a custom tile shower will be a selling advantage. High cost: Custom tile showers are almost always more expensive than pre-fabricated shower units. Labor intensive: When constructed with a custom tile shower pan, this is a difficult project for most DIYers and a lengthy, labor-intensive project for pros. DIYers may choose a middle option: mating a fiberglass/acrylic shower pan with tile walls. Likelihood of leaks: Shower pans, in particular, can be prone to leaking over time if they have not been perfectly installed and maintained. Wall tiles can also leak of grout lines aren't maintained and regularly sealed. High maintenance: Although ceramic tile itself is very easy to clean, tile showers have grout lines that need to be maintained. Unless regularly sealed, they will be prone to mildew, cracking, and possible leaking. Heavy. A large ceramic tile shower puts many hundreds of pounds on a floor structure. Unless the floor is very sturdy, it may flex and break the grout joints or even the tiles themselves.